3) Write, Read, and other lofty goals. Through the extended generosity of one long standing McCarthy residents, I now have a place to stay. And since Tuesday (three days ago) I have a job washing dishes at The Roadside Potatohead, AKA “The Potato.” It’s not the most stimulating work, but having a place to receive mail, a place to shower, and a tasty meal after each shift, which goes a long way out here. (likely more later). For now I’d like to catch up on setting down the fun stuff I did before getting into McCarthy. So in no particular order here are some of the highlights from the first few weeks of my time in Alaska this Summer. 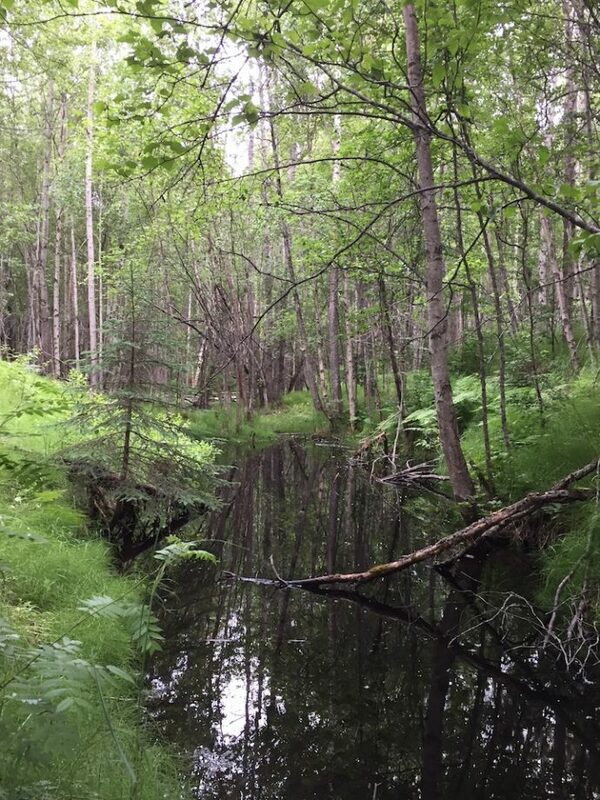 Since everyone’s first comment about Alaska is some variant of: “Oh yeah, how are the mosquitos up there? I heard they’re just the worst.” I figured it would be fun to include this video. Shout out to Jesse for letting me document his torture! They aren’t usually this bad but every so often you’ll come across a large swampy area with plenty of stagnant water for these buggers to thrive in. 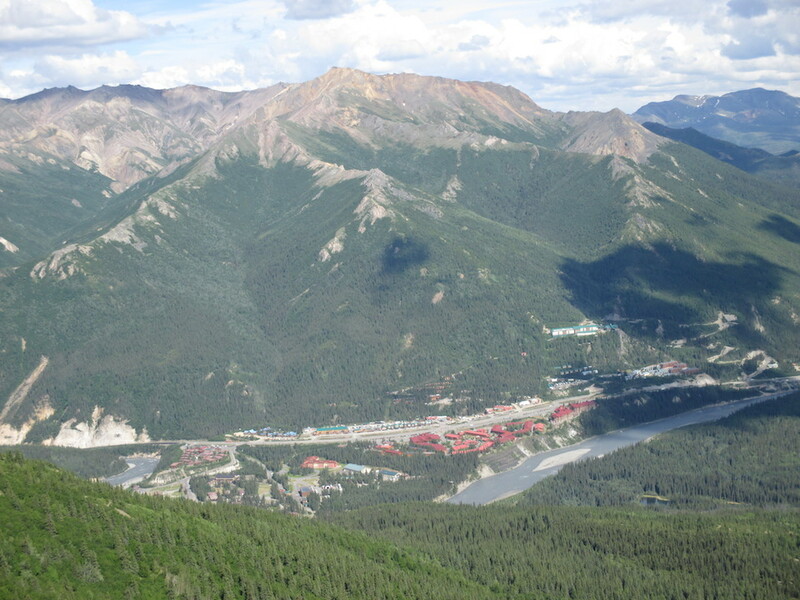 It remains a mystery to me how this many mosquitos can be supported with so few blood donors around, but there you have it..
Denali Village as seen from the lookout trail to is south. 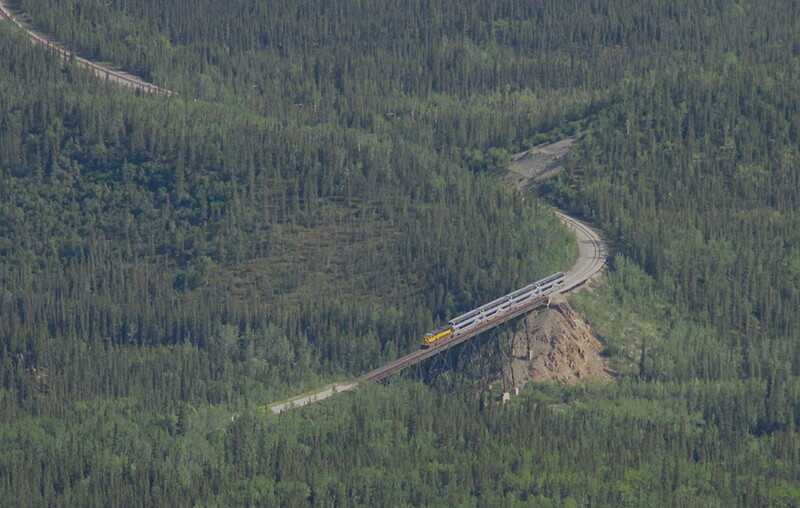 Train arriving in Denali. I had hoped to ride this train up from Anchorage to experience the wilderness without the trappings of road travel ,but the cheapest seat was $200. A $75 shuttle bus ticket persuaded me otherwise. 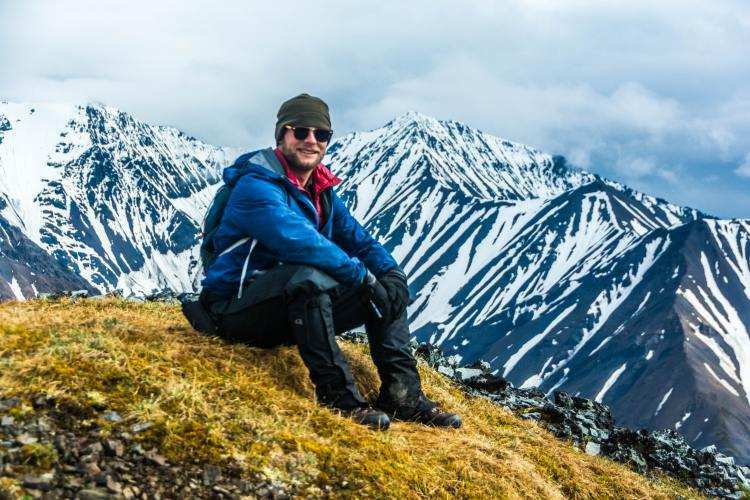 As I mentioned earlier, I stayed with Jesse at the Denali Air Airport and Crew Complex. 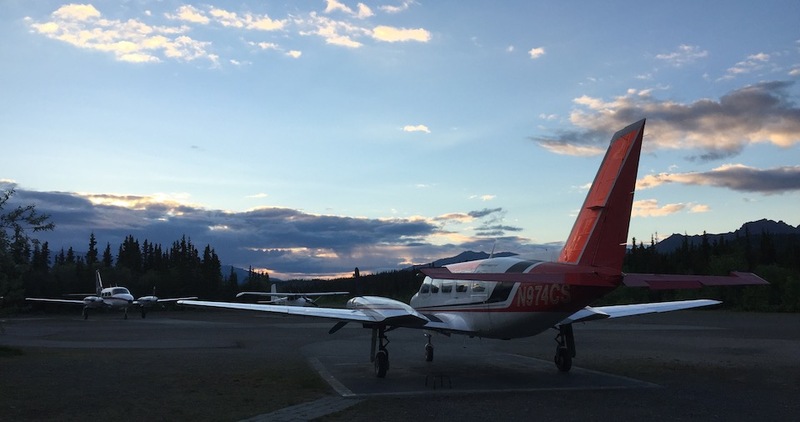 Because of their generosity I feel obligated threefold to promote the Denali Air operation. Once for the financial gift of squeezing me into an empty co-pilot seat, and twice for how soul scratching and mind quieting those voyages were. 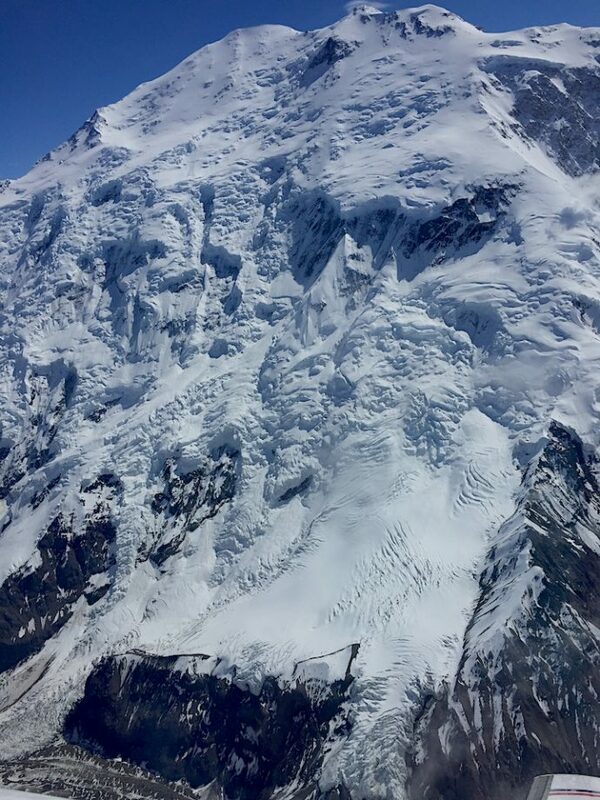 This face on the north side of Denali is called the Wickersham Wall. Between the peak at the top of this picture and the black ice of Jeffery Glacier (bottom-left) stretches a vertical elevation change of more than two miles. We are much further away from this wall than you would believe. 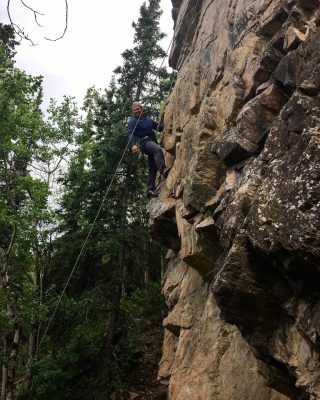 I got to do some climbing in Denali NP too. 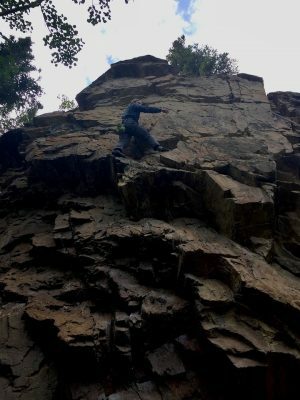 Much of the rock in Alaska is to crumbly for rock climbing, but there’s still spots. Hotel Rock shown here. 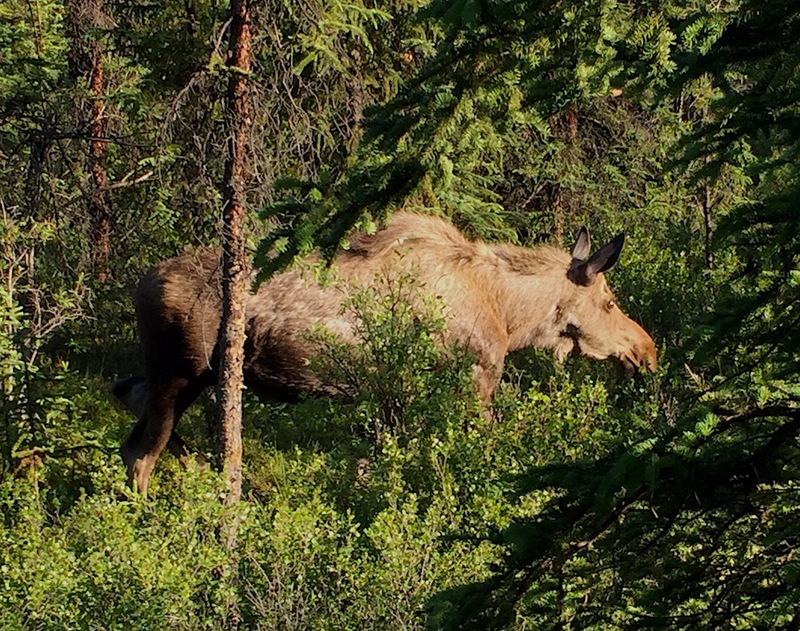 Moose right outside the Denali Wilderness Access Center. Thats a whole lotta animal, folks. 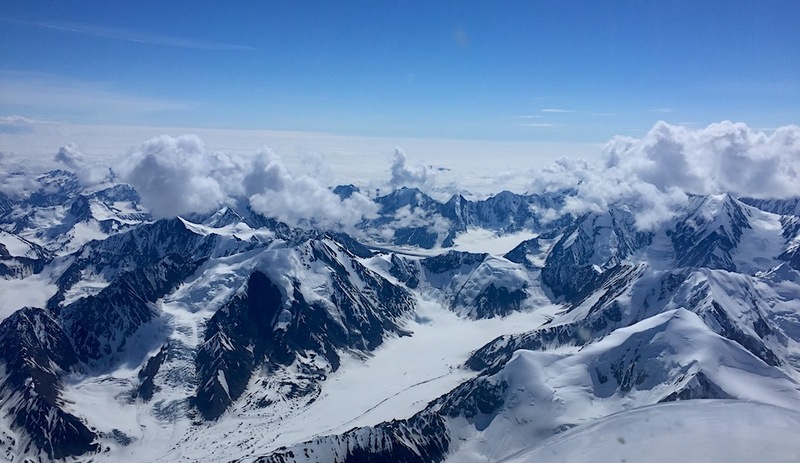 From Denali I swept back down to Anchorage. I’ve only hitchhiked a few times, and this time was by far and away the easiest most enjoyable ride. There was a thunderstorm brewing northward over Healy with full-on near-black clouds and whips of lightning that began entering the soundscape. As the sprinkling rain was beginning to shower a gentleman named Pat slowed down to help me out. 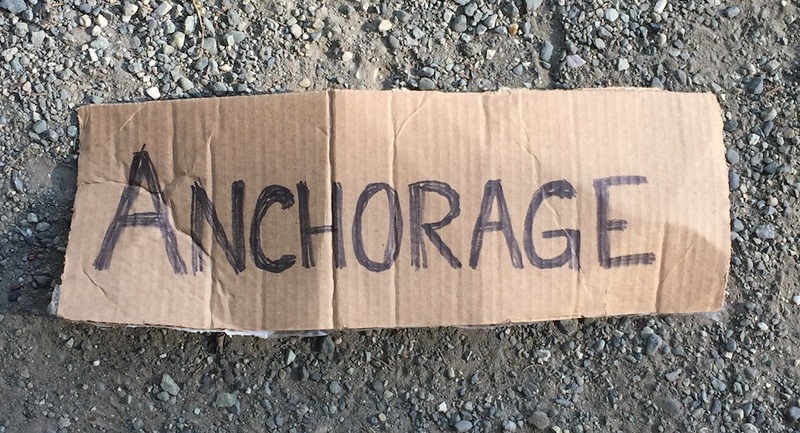 I felt a little bad about getting a ride so easily because there was another hitchhiker about a quarter mile down the road who had been out there before me, but there wasn’t much to do to right the situation. I piled in and wished her luck as we zoomed by. Pat turned out to be a real big heart. He had been a radio repairman in the Gulf War and now worked as a caretaker for terminally ill children. I think the unguarded conversation we had about life’s course and our aspirations was predicated on the fact that we wouldn’t know each long. 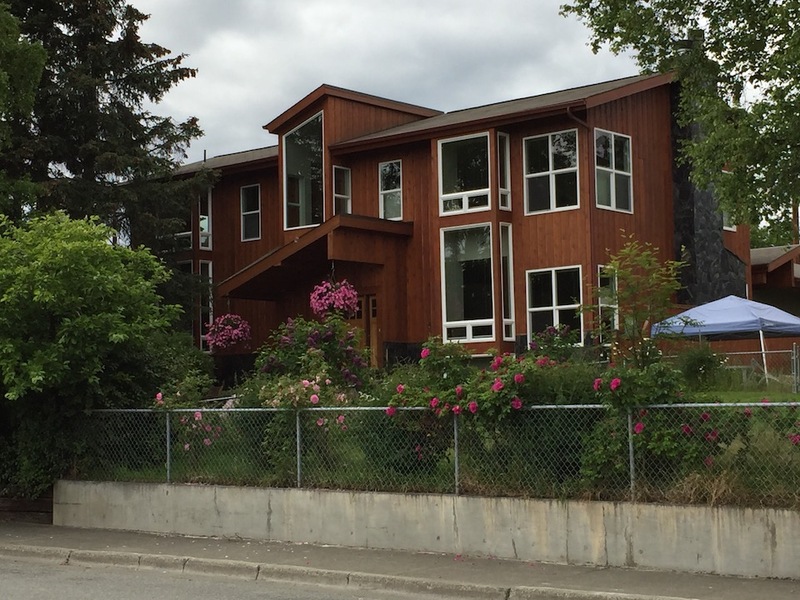 I spent a week in Anchorage at the Spenard Hostel. My time was mainly consumed with studying in the public library for my pilot license written exam. 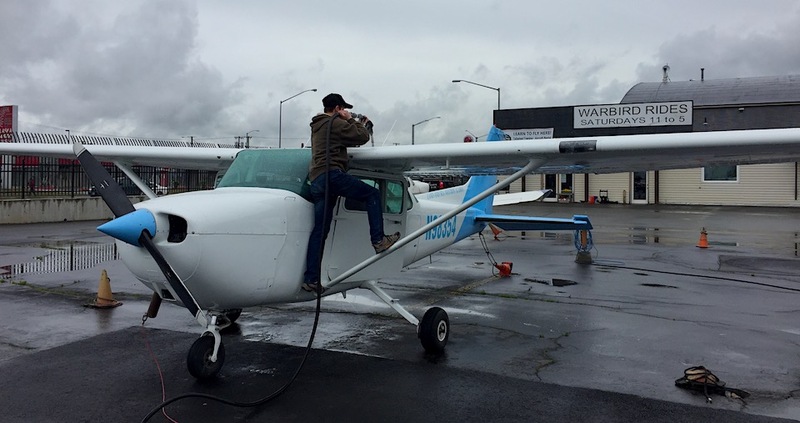 All my training up to that point had been in a Liberty XL2 (wiki) so I scheduled a lesson in a Cessna 172 to acquaint myself with the layout and feel of a high-wing carbureted plane. My instructor had to be no older than 22 or so. 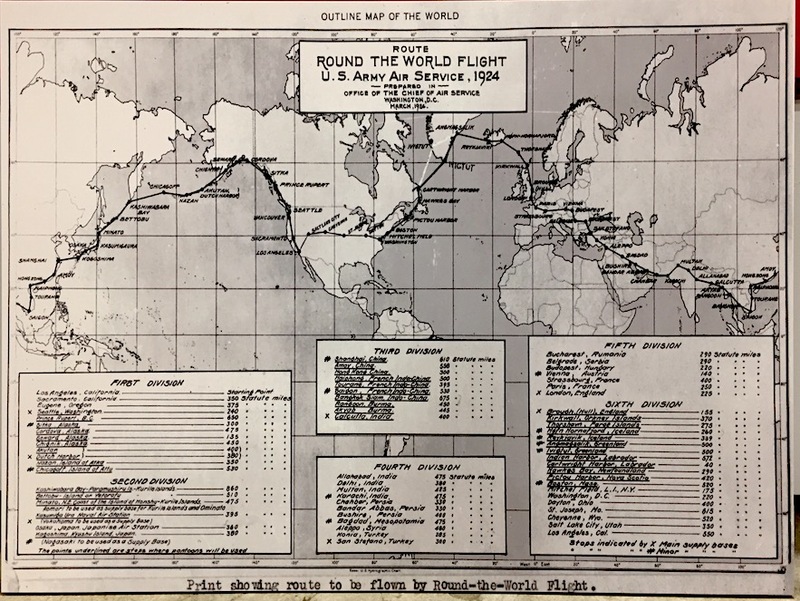 He didn’t give very specific direction for the maneuvers we practiced, and his explanation of the complicated airspace above Anchorage was weak. I tried to make the best of it, but I admit, I did judge him for his instructor skills, and I ascribed it to age. He kept a stash of jolly rancher candies and a fidget spinner in the mesh pocket on the side of his backpack. 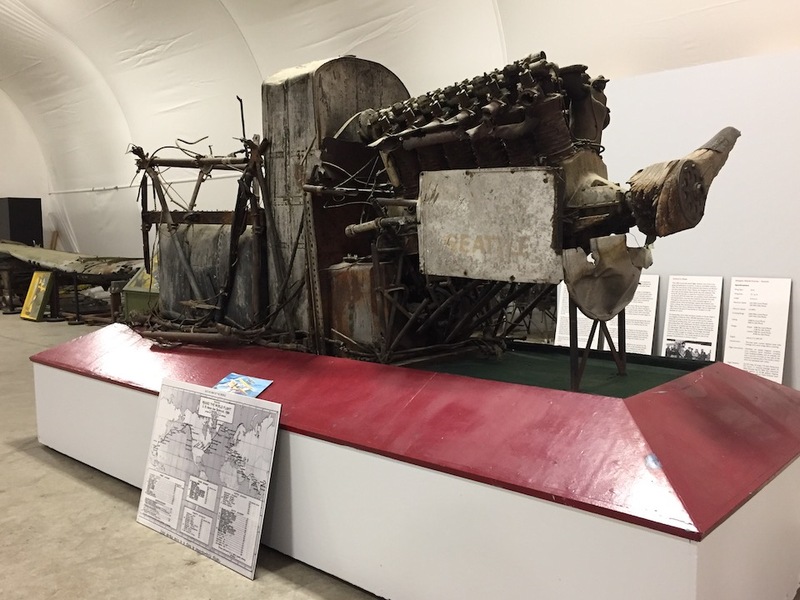 I spent a day at the Alaska Aviation Museum near the Lake Hood Aerodrome. 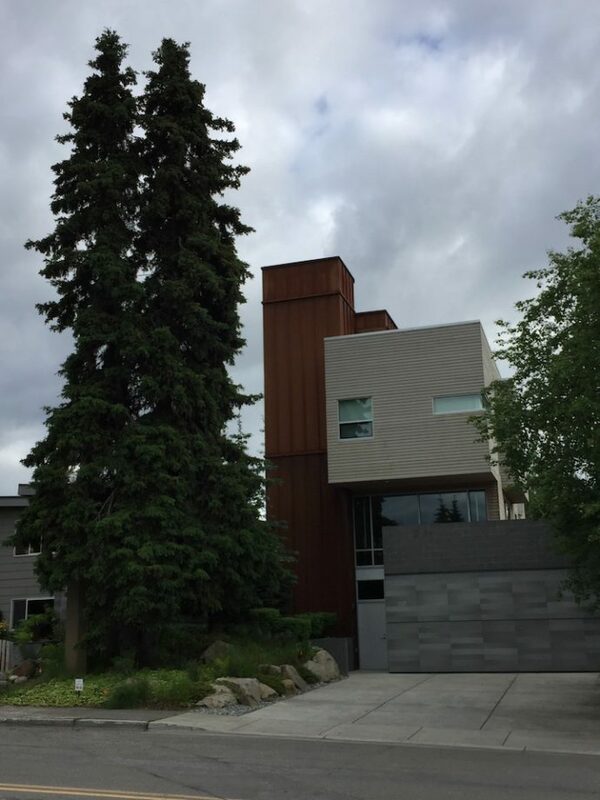 A few neighborhoods had some provocative architecture. 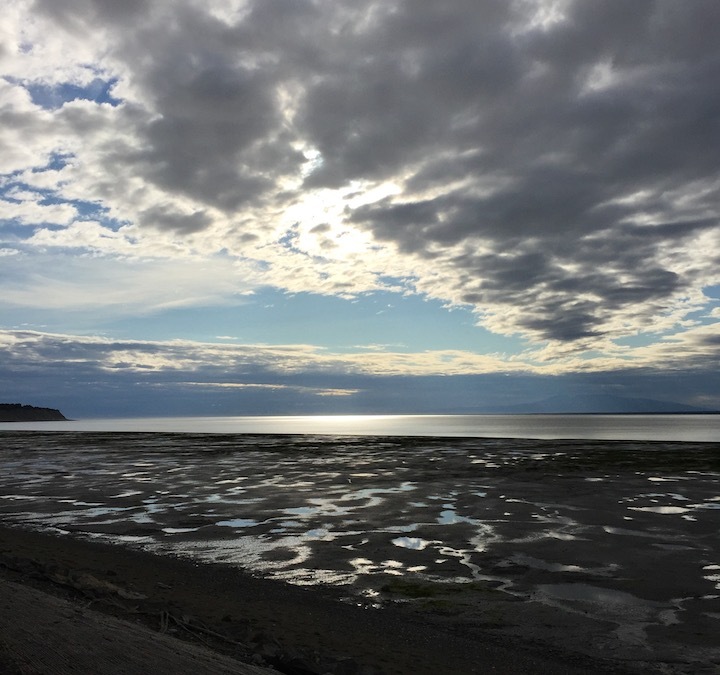 Late afternoon on the Tony Knowles Coastal Trail. I laugh when I look at this picture because it wasn’t all that exciting of a view until I was on my way back to the hostel and the light was hitting it just right. Otherwise, I’d forgive you for thinking they’re just some smelly mud flats. And heres a picture from Earthquake Park off the Coastal Trail. A huge chunk of land slid towards the water during the 1964 “Good Friday” Earthquake (wiki) and now you can walk through the chopped up mounds of overgrown earth left behind. That about wraps it up. From Anchorage I caught a ride with a friend into McCarthy and arrived on the 3rd of July – just in time for the Independence Day.